We are very excited to now offer LATISSE at Brightbill/Ericson Eye Associates New Vision Laser Center. 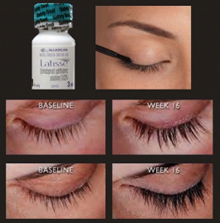 LATISSE is the first FDA-approved treatment for inadequate eyelashes. It is applied to the eyelashes growing them longer, fuller and darker. Our ophthalmologists and optometrists can perform your initial evaluation and follow-up evaluation to insure that you are using it properly and are getting the results you desire, and LATISSE can be purchased in our optical shop. Contact our office today to schedule an appointment, and visit www.latisse.com for more information.